When you picture a vegetable garden, you might imagine a spot that bakes in the sun all day. For some vegetables, such as tomatoes and peppers full sun is ideal. But if you do not have a garden in the best location or have an large periphery with less light, there are plenty of vegetables that will grow well without full sun. Keep in mind that no vegetable will grow in full, dense shade. The following crops will produce with three to six hours of sun, or fairly constant dappled shade each day. Like peas, beans are a little gift for the hardworking gardener; beans take very little effort. There are many varieties of bush beans and pole beans that can deal with some daily shade and take up very little space. There are many types of beans to choose from and are easy to grow from seed. You can even be frugal and save some beans for next year’s seeds. Beets sort of break the rules for planting root vegetables in partial shade and can do surprisingly well. While the shade may impact the size of your beetroots, the plants will still produce delicious greens. If you’re short on space, beets can also do quite well in a deep container. For a continual harvest, keep planting a few seeds every week or so. Just be sure to keep it watered so the roots do not turn woody. Lettuce—a staple for any salad is a cool-season green that dislikes direct sun. Some gardeners even shelter lettuce with shade cloth to prevent it from burning out. You have a few options when it comes to planting these great salad greens as a way to enjoy it throughout the season. For instance, you could succession plant it or simply use the containers as a “cut and come again” garden, picking the oldest leaves as needed. Spinach does well with only a few hours of sun and it prefers the cooler temperatures of spring and fall. Spinach—in particular, baby spinach—is a great salad green for sure, but it is also very useful in your favorite hot, non-salad recipes. Plant the seeds early and you can pick the leaves off all summer long. Radishes are another surprising root vegetable that can tolerate some shade. It also produces tasty greens that most people forget about. 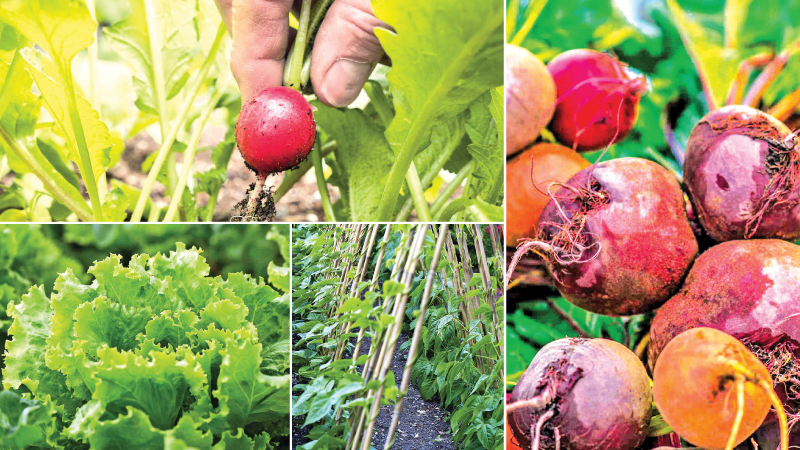 With radishes, you have many options when it comes to varieties. It is fun to sprinkle many different radishes throughout your garden. Some mature fast, some like the fall season, and the sizes vary as much as the color. Have fun with all the possibilities.